Precast Concrete Supplier Albuquerque, NM. 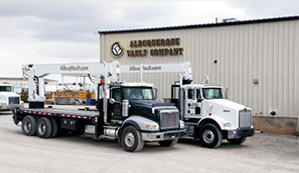 Albuquerque Vault precast concrete Supplier and manufacturing company in Albuquerque New Mexico offers quality precast concrete products for a wide variety of applications. We specialize in concrete utility products, IE; manholes, lift stations, storm structures, and drop inlets. 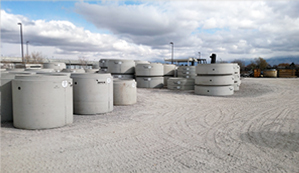 We also manufacture concrete utility vaults, sand and oil separators, grease traps, septic tanks, retaining walls, concrete pads, stepping stones and concrete edgers. We are NPCA (National Precast Concrete Association) certified, insuring our quality control and consistent high standards. We can manufacture and deliver up to 20,000# pieces of precast concrete products. We use exclusively self consolidating concrete (SCC) in all of our products, insuring a minimum 5000 psi concrete strength with a smother finish and less bug holes than standard concrete. Weekly cylinder break test performed by certified lab. We batch our own concrete and pour indoors, allowing us to produce year round. High quality precast concrete products for a wide variety of applications. We specialize in concrete utility products, IE; manholes, lift stations, storm structures, and drop inlets.